Clean and Cool Missions help early stage clean tech companies from the UK to reach people across the world. It primarily focuses on helping them to do work in the United States and developing countries. Below are excerpts its website. These give details of the work carried out in 2013. You can discover more about the organisation’s latest work via the following links. 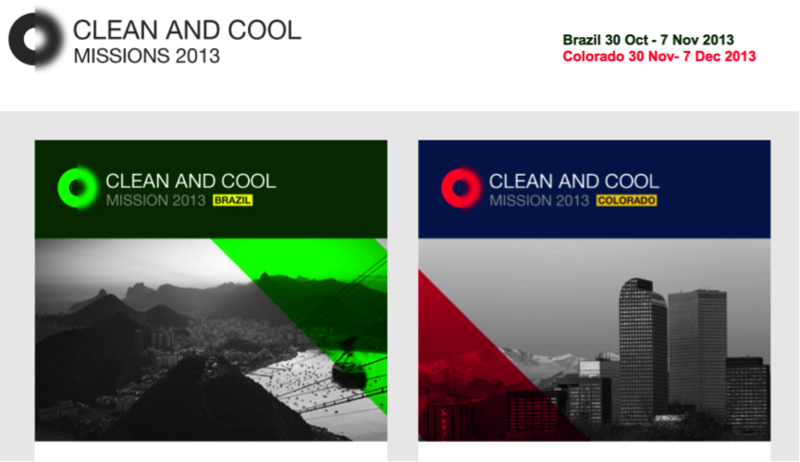 Clean and Cool Mission Colorado is an entrepreneur mission to help 20 of the UK’s most promising early stage and innovative cleantech SMEs do business in the US faster. The Mission will help winning companies: develop quality contacts with investors and partners, gain unique insight, profit from fresh stimulus, and improve pitch and profile. What is the aim of Clean and Cool Mission Colorado? The goal of the Mission is to act as an accelerator for up to twenty of the UK’s most promising cleantech SMEs, with innovative business models, products and services that are actively seeking opportunities within the US. The Mission provides an unparalleled platform and agenda for the winning companies to gain profile, insights and relationships with potential investors, customers and partners that can help them develop and succeed more quickly. Which areas of technology does Clean and Cool Mission focus? The key areas of focus are innovative, profitable and scalable technology, services and business models within the areas of smart grid, energy storage, system integration, buildings, transport, solar and wind energy, who are looking for investment or new partnership opportunities within the US. Innovation: Breakthrough in product, service or business model and its potential impact. Market: Interesting, immediate and clearly identified market within the US. Ability: Team, track record and readiness to do business in the US. As per previous Missions, the balance of the group will also be considered in making the final selection to deliver a message of the diverse nature of the UK’s technology sector. In a few cases, some criteria may be relaxed for younger companies presenting profoundly innovative ideas. The competition is open to UK registered cleantech SMEs and it should be the CEO who attends if the application is successful. Who organises Clean and Cool Mission Colorado 2013? The entrepreneur-led Mission is organised in partnership by The Long Run Venture and The Co-Sponsorship Agency with the Technology Strategy Board, UKTI and private sector sponsors. The Long Run Venture is responsible for co-ordinating the week-long programme of activities in Colorado, UK activities, liaising with Mission companies and the Mission logistics. There have been eight previous missions, supporting the most promising UK entrepreneurs and early stage businesses working in web innovation, future health and clean technology. Clean and Cool companies are developing the new technologies, services and business models that address our greatest environmental, energy and resource challenges. The 2012 Mission coincided with the Cleantech Global Forum and was attended by innovators in energy storage, energy efficiency, renewable energy, agriculture and transportation. Web Missions embrace innovations in the “Web Economy”, including mobile, social, semantic and real-time web technologies; Cloud2; social gaming; and 3-D/RealVR environments. Web Mission 2011 travelled to San Francisco following on from the Game Developers Conference and leading on to SXSW. Future Health Mission 2012 took twenty early stage and high growth potential companies to Boston. The winners represented the most promising transformative technologies, services and business models to address our future healthcare challenges in the fields of assisted living, diagnostics, stratified and regenerative medicines.